1.1 The Alliance of Retired Public Servants is comprised of pension organisations representing about 140,000 retired public servants – including former civil servants, local authority and health employees, teachers, nurses, doctors, Gardai, defence force and fire service personnel and others. 1.2 The Alliance has been recognised since 2013 by successive Ministers for Public Expenditure and Reform as representing public service pensioners. Public service pensions have been subject to reductions in pensions on foot of emergency powers under the Financial Emergency Measures in the Public Interest Acts 2010 to 2015. 1.3 The government decision in relation to pension restoration under the 2015 Financial Emergency Measures in the Public Interest Act, 2015, was taken following consideration of a submission in this regard by the Alliance. The Alliance does not, however, have any formal recognition or access to third party independent mediation or arbitration. – Access for retired public servants to State industrial relations machinery. 2.2 The distinct case for early restoration of pensions is outlined below in this submission. The Alliance also welcomes the support of the Public Service Committee of ICTU for the principle of a faster rate of restoration of pensions as outlined in its submission to the Public Service Pay Commission. 3.1 The entitlement of public service pensioners to their pensions is a property right under Article 43 of the Constitution. It is difficult to see how continuing public service pension reductions comes within the constitutional framework under which such rights may safely be regulated by law. – reductions of between 2% and 8% in relation to annual pensions above €32,500 per annum of those who retired post February 2012. FEMPI cuts from salary had already been made from the post February 2012 retirees generating an ongoing reduced pension, yet unrestored. 4.2 Briefly, the legislation provided for restoration for individual pensioners of up to €400 in 2016, €500 in 2017 and, if still within the deduction net, €780 in 2018. 4.3 The cost of this restoration is €30m in each of the three years 2016 to 2018 and would at the end of 2018 leave approximately 25,000 public servants with pensions over €34,132 per annum still subject to emergency deductions initiated in 2011. The gross annual pension reduction remaining at the end of 2018 is understood to be in the order of €45m (substantially less when net of tax). 5.1 The current position in relation to pension restoration under the 2015 FEMPI Act, for pensioners who retired pre March 2012, is outlined in Table 1. 5.2 It should be noted that pay restoration under the 2015 FEMPI Act is on a basis agreed with public service unions under the Lansdowne Road Agreement and was brokered under the auspices of the WRC. While the Alliance of Retired Public Servants made a submission in 2015 to the Minister for Public Expenditure and Reform on pension restoration and had consultations with his Department, it did not have the option of a third-party intervention to facilitate agreement. 5.3 Furthermore pay restoration for serving public servants under the Lansdowne Road Agreement has recently been enhanced, following a Labour Court recommendation in relation to Gardai. The Alliance sought an equivalent beneficial adjustment in the pension restoration schedule but this request was not acceded to at the time. 5.4 This is clearly inconsistent with the view expressed in Dail Eireann by the then Minister for Public Expenditure and Reform during the discussions on the 2015 Act and, subsequently in public, that priority should be given in future to the early restoration of pensions. The comparative disadvantage suffered by retired public servants should now be taken into account. 6.2 Table 2 illustrates the extent to which post February 2012 public service pensioners will not return to full pension rates even when full pay has been restored to their serving counterparts. This group of pensioners will be in an extraordinary situation in that pre-March 2012 pensioner counterparts will, on post-emergency restoration, return to full pension and serving staff to pre FEMPI pay levels (allowing them to retire with full pre FEMPI pensions). 6.3 The pension of a public servant who retired post March 2012 was calculated on the FEMPI reduced salary of 2010 (column 2), which generated a significantly reduced pension compared to the pre FEMPI pension in (column1). 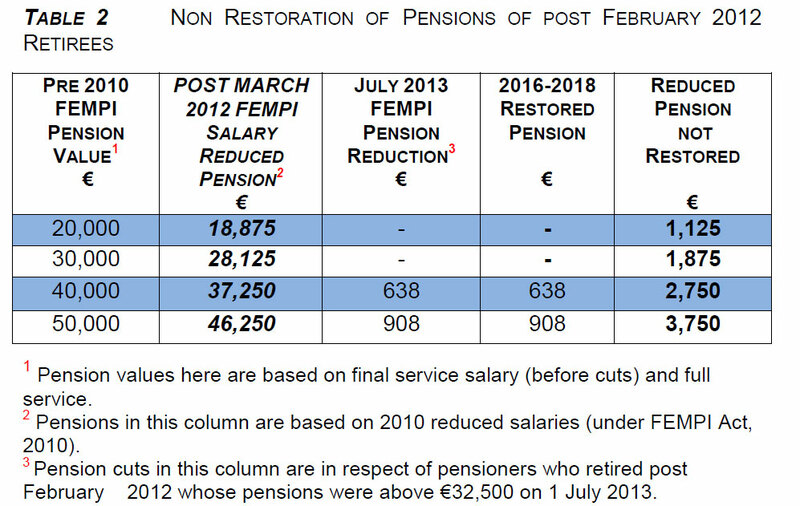 Column 3 illustrates the impact of the 1 July 2013 FEMPI pension cut for this group. This is the only element of their emergency reduced pension, which benefitted from the 2016 to 2018 restoration measure (column 4 refers). 6.4 Column 5 highlights how the post February 2012 pensioners will, under present arrangements, continue as if they were in a bubble of their own condemned to exclusion from restoration of the bulk of their emergency induced cuts. This is a grossly unfair penal measure and should be reversed as a priority in forthcoming restoration talks. 6.5 The gross unfairness of this position is reflected not only in the fact that this group will carry their emergency cut to their grave but will even pass it on to their surviving spouse or other dependants after they have died. 7.1 The financial emergency that gave rise to the use of emergency powers in relation to public service pensions is over, and a wide range of new services is increasingly being put in place. 7.2 The decreasing amount of pension reduction collected each year is no longer of significance in overall financial or budgetary terms. The benefit to the State is no longer proportional to the continuing burden being suffered by individual pensioners who also have to deal with wider austerity measures. 7.3 Public service pensioners are private citizens who have completed their contract with government and are in a separate legal and practical situation from serving staff who are in continuing employment with government and who have access to the industrial relations machinery of the State and have a much wider range of income increase options open to them. 7.5 Despite popular misconceptions that public service pensioners are privileged the reality is that the average public service pension is in the order of €20,000 per annum and that public service pensioners do not additionally receive the State pension. 7.6 Equally, the treatment of public service pensioners who are required to pay the Universal Social Charge on all their pension income is fundamentally unfair in comparison with their private sector counterparts who pay no USC on their State pensions. 7.7 The treatment of public service pensioners contrasts most unfairly with the approach adopted by government in 2011 when it recognised the property rights of AIB (99% State owned) private sector pensioners and authorised €1.1bn of State funds to be put into the AIB pension funds. 7.8 Responsibility for any new financial emergencies or the provision of increased services is a community responsibility and should be addressed in the context of general taxation and not visited on public service pensioners on foot of continuing use of emergency powers. Even the Exchequer levy imposed across all pension Funds in response to the financial emergency has been lifted. 7.9 The justification, recognised by successive Ministers for Public Expenditure and Reform, and by the Public Service Committee of ICTU in its submission to the Pay Commission, for priority treatment in restoring public service pensions, should now be matched by full pension restoration without delay. 8.1 The framework for increases in pension is a matter which is of great importance, not least because there were over 50,000 retired public servants on pensions of up to €12,000 who were never subject to pension reductions and who have received no increases in pension notwithstanding the fact that their equivalent serving public servants have received increases in pay. 8.2 The parity based framework, whereby pensions increased in line with pay, was, in effect, suspended during the emergency but, with the unwinding of the FEMPI legislation, the legitimate expectation of retired public servants is that custom and practice should be followed and the principle of parity restored. Successive governments since 1969 have adopted the principle of pension parity leading to its full implementation in 1986. These developments underpin the legitimate expectation held by the current generation of public service pensioners serving over those years and beyond. 8.3 Retired public servants contributed to their pensions (which included a parity based approach to increases) at rates deemed appropriate by successive governments. Furthermore the value of pensions, based on the actuarially calculated pension costs of the Public Service Benchmarking Body in 2007 have reduced over the past ten years with substantial reductions in pay and pensions and given the absence of assumed pension increases based on CPI plus 2%, not to mention the reduced pension costs for newly recruited public servants. 8.4 It should be further noted in this regard that there are scheduled increases in social protection payments (which are to be maintained above CPI rates) whereas the comparative position of the lowest paid public service pensioners, who have received no increases in pension, is further deteriorating. 9.1 Serving public servants have both direct access and access through their unions to in house or ad hoc mediation or arbitration and through the formal industrial relations machinery of the State. 9.2 The Croke Park, Haddington Road and Lansdowne Road Agreements would not have been concluded without ad hoc involvement by the LRC/WRC nor would the recent Garda dispute have been resolved without the involvement of the Labour Court. These mechanisms have been an absolutely vital element for government and serving staff in the unwinding by agreement of the FEMPI legislation in relation to pay. 9.3 The unwinding of FEMPI in relation to pension reductions is of equal importance to retired public servants and it is difficult to comprehend the blank refusal by government to provide any form of third party mechanism to help resolve difficulties in this regard. 9.4 This question should now be addressed. Public service pensions are deferred pay and arise directly from employment by the State. It is, in the Alliance’s view, increasingly untenable and unjust for any government to continue to maintain that they will provide no third-party access for 150,000 retired public servants on any matter relating to pensions.